Cupcakes 'n Daisies: Bounce . . . . . There's a new quilt hanging in my living room, and when I say new quilt I mean new quilt! This is this quilt's world premiere, from my living room to you! This is Bounce, a new pattern by Miss Rosie's Quilt Company. Earlier this year Carrie Nelson asked if I would be interested in sewing a quilt for her for spring market, this is the quilt I got to piece, it didn't make it to market, but neither did Carrie! So all those folks who went to spring market missed out on this quilt, but that means you get to see if first! I also got to make a few of my own choices, Carrie was great that way, "do what you think looks best", she would say, so I would. This is the fabric Carrie selected. Hope Valley by Denyse Schmidt for Free Spirit Fabrics. I got to decide whether to go totally scrappy or scrappy within each color way. I chose scrappy within each color way. This is fabric I would had never bought on my own, it's way outside my normal fabric comfort zone. But I loved working with it, loved how it looked when I pieced the blocks, loved it more when it was done. I am now more open minded about these colorful modern looking fabrics that are popular now and expect to buy and use more of them in my projects. So here are all the blocks before the bounce effect. The pattern suggests you may want to put the blocks on a design wall before making them bounce, it's a good tip to follow. You have several choices to make when you start on this pattern. One is to go with scrappy stars with pieced blocks in the center, or a star made using one piece of fabric. My version has the scrappy stars. You can also decide to go with all big stars, like Carrie did, or big and small stars like my version. Here it is all pieced and bouncy. You also have two choices on the border, here's a closeup of my version. I stayed scrappy but within color ways, like the stars, and all my strips are the same width. Along the way I would suggest ideas to Carrie on how to make the pattern better. She was great about listening to my ideas and even better about explaining why my ideas wouldn't work for this particular pattern. (there's more to this pattern business than you would suspect!) One of my favorite ideas was to not provide a layout with the pattern, make folks do their own. I was afraid everyone would try to cut their blocks exactly like mine, and I would like everyone's Bounce to have their own bounce. Carrie very politely let me know that when folks buy patterns, they expect a layout page. It makes me laugh to think about it now, yes even I expect a layout page, and some of you think I should design patterns? Here's the pattern. Lucky you, it's available for purchase in Carrie's online shop, today, now! You can select a PDF version (click here) if you can't wait a single second to own this pattern, or you can buy the paper version (click here), which will be mailed to you. I'm sure it will be showing up in your local quilt shop also, but why wait when you can have it now! It finishes at 70" x 70"
It has approximately 956 pieces. I can hardly wait to see new and different versions of Bounce. I'm really wanting to see one with a scrappy background. I may try that myself. (PLEASE someone make a Minick and Simpson Bounce for the 4th of July!) Be sure to send me a picture when you finish your Bounce! What better way to celebrate a new pattern than with a giveaway. Even though I didn't name this pattern, the name has nothing to do with me at all really, I'm the sort of person who wakes up happy most every day, it's just my nature to get out of bed with a bounce in my step. So while it was really just luck that I got to make this particular quilt for Carrie, it was a perfect fit, this pattern suits me and my personality. If you would like to win this pattern (donated by Carrie Nelson of Miss Rosie's Quilt Co.) and a layer cake of your choice to make your own Bounce, leave a comment on this post by Friday, June 29th. I'll announce the winner on Saturday. In your comment I would like to know what puts a bounce in your step! My Bounce was quilted by Linda Hrcka at the Quilted Pineapple. Today she's going to talk about how she quilted Bounce and show you lots of nice close-up quilty pictures. The quilting on this project is amazing, be sure to stop on over. So thanks Carrie for what I would consider the opportunity of a lifetime, a quilt I pieced on the cover of a pattern, it could not have been more fun! OMG I love this pattern! I love that border!!!! and well stars, how can one not like stars,hmmmm totally scrappy I may just have to do that! bounce in my step when I see quilts that inspire me! Wunderschönes Muster und ganz tolle Stoffe. New fabrics and new patterns puts a "bounce" in what I make and enjoy. The Bounce pattern is absolutely gorgeous and I love the pieced border. I love the way the placement of these stars really does make a bounce. I get a bounce in my step when I finish a project. Thanks for the chance to win this fun pattern. I LOVE your Bounce quilt! And I love the name Bounce---it just sounds like fun! Fabric in the mail, unexpected (or expected) sewing time, and a finished project all make me bounce! I'll volunteer to make the Minick and Simpson version...what a great pattern! Definitely close to the top of my "Have To Make" list! Amazing quilt Thelma! Carrie is so wonderful to work with! Beautiful. I love the way the stars light up the quilt! Good friends put bounce in my life. Hi, I'm new to your blog, I just came over via inspired by antique quilts. Chose a good day to visit, Bounce is stunning! I love it. Right now I'm craving sunshine and sea to put a bounce in my step. What a great pattern and a great quilt! Loving life is what puts a bounce in my step. I get to get up every day and do what I love! I love stars and this pattern is adorable! I love the fabrics used in yours, but a red, white, and blue one would be brilliant! What puts a bounce in my step? Someone one being a little inspired by something I have made and them being excited to make something of their own. My "bounce" is to look at Carrie's blog see a picture of a part of a quilt. Not reading properly, so looking at patterns but not able to find the pattern of the quilt of the picture.....until today and even a chance to win it. My ceiling is nearly high enough, because I bouncin pretty high. Thanks to the both of you. Gorgeous! !I have a few FQs of that line but unfortunately not enough to duplicate your gorgeous piece. I love this take of the pattern. I love what you did with the border too. The way the borders are not all scrappy but in colorways. Excellent choice. Beautiful pattern & fabrics, wonderful quilting, thanks for the link, congrats Thelma. For me a sunny day, a new collection, an inspirational blog, are some things who make me bounce. I love being up early and being able to greet the sunrise on my morning walk. That puts a bounce in my step! This quilt is gorgeous...as are all the quilts you post. Thanks for the giveaway opportunit! Oh, I love that pattern and can totally see it done in patriotic colors. You are stunt sewing now! I love both the pattern and the quilt you made - so fresh looking. Love this quilt. I love the stars, the border and the happy feel of the quilt. What put a bounce in mys step? Hi, just came from The Quilted Pineapple--Oh love the bouncing stars it would be gorgeous in Minick & Simpson fabrics! Thanks for the giveaway! What a beautiful quilt! I look forward to seeing it in different color ways too. Linda is an amazing quilter, I am off to go see what she did with this. How fun for you. It is really a cool quilt.Thanks for the chance to win the pattern. Another great pattern by Carrie, and your version is beautiful, another to add to my to do list !! I love this quilt! Carrie always has such cute patterns. Spending time with my little granddaughters puts a bounce in my step. Thanks for a chance to win this pattern and some fabric. I love starting my morning in sunny, hot Arizona with a lap swim in the backyard. There are birds singing, butterflies in flight, and bees buzzing, oh, and a jet or two heading for Sky Harbor Airport. That early morning swim gives me a bounce for the day. As I. was reading your post, I was mentally going thru my stash wondering what I could use and thinking how great "Bounce " would look with a scrappy background. Great job, now I wiah I still had some "Hope Valley" left. Love the quilt! I can see this done in some red/white/blue too but your fabric is great!! I would not have purchased that fabric - not a style that I usually work with but great opportunity to see the fabric used. Maybe I need to "branch out", using some of the newer lines! Bounce in my step...another new day, my faith, my life with my husband..today is our 52nd anniversary, sunshine, family, a good book and always sewing time! Having time to quilt in a day puts a bounce in my step! Great post and a very fun quilt. Love this quilt. I'm mentally going through my stash right now. Going for an early morning walk on a quiet, cool morning puts a bounce in my step for the day. This is such an exciting post to read Thelma...loved reading every word! What a great honour not only to be invited to make a premiere Carrie quilt, but also to be the "cover girl" on the pattern! I'm so excited for you! And that puts a bounce in my step... to enjoy the wonderful surprises that come along in life and celebrate with friends...congratulations! This is really a beautiful and cheery quilt! The name fits it perfectly. Add my name into the drawing as I love any quilt that has stars in the mix. I love your quilt! My little ones put a bounce in my step! Thanks for the great giveaway! I LOVE this quilt! Stars are my favorite blocks and this design really shows them off. And the border- wow!! Simple and so cool! Thanks for the generous giveaway. The anticipation of a new project puts a bounce in my step. I think this could be the next one. Thanks for the giveaway! I read Linda's blog first this morning and as always, was in total awe of her quilting. I agree with you, rw&b--and if I wasn't in total "get the house ready to sell" mode I'd be starting it today!! How much fun! I love the border on this quilt. I find that Carrie puts a lot of thought into her patterns, but how wonderful to find out that she seeks advice from the people who piece her quilts! Sign of a great designer, I think. You did a wonderful job (not surprisingly) on this! I'm not surprised she asked you, especially after the Thelma quilt! I love how your quilt came out! It's a great pattern, Carrie never disappoints. I think I'd make mine in Friendship. I love this pattern Thelma, but then again I love all of Carrie's patterns ;-) Love the scrappy look too. Although wouldn't it be a stunner made up in Reds!! Morning walks with my dog put a bounce in my step! A great way to start the day - and can't help acknowledging how happy it makes my dog, too! Your quilt is a beauty - thanks for the opportunity to win. How exciting to stitch Bounce for Miss Carrie!! I love your large and small stars. Getting to quilt each day certainly puts bounce in MY steps!!! What a fun quilt! I'm like you, I wake up ready to start my day. There's nothing better than getting into the sewing room for an hour or two, first thing in the morning. Thanks for the giveaway! What a pretty quilt...love the fabrics! Walking into a quilt shop puts a bounce in my step. Thanks for the sweet giveaway! Lucky you getting to piece this quilt, it's beautiful! Spending time with my 22 month old granddaughter puts a bounce in my step. It would make an adorable patriotic quilt. And as for the bounce in my step, I'd have to give all the credit to my awesome husband. He's out of town, so I get a little giddy when I get to talk to him on the phone. Thanks for the giveaway - now what layer cake to choose? Beautiful quilt! I get a bounce in my step from spending time with my family, especially my little granddaughter. Time spent with fabric and anything quilt related keeps me stepping high, too. Thanks for a chance to win. What a beautiful quilt! Congratulations to you, Cover Girl! I was just checking out Carrie's new patterns on her website. They are all fabulous-of course!!! I would love to win the Bounce pattern. Some cooler weather would put some bounce in my step--it has been 100+ for the past few days. I love the border on this and the fact that the stars float so no accidental loss of points. I'm thinking rainbow batiks for this or maybe my bundle of Outfoxed by Lizzie House. What a fabulous quilt!! I bounce when I eat an ice cream at the seaside or discover a fabulous new fabric shop or get something lovely in the post! Lovely comments on my blog/Flickr photos also make me bounce!! A totally fun quilt and love all the different options, scrappy, not, big stars, little stars. Perfect for me that has a hard time following a pattern! I adore your bounce quilt! Beautifully pieced and quilted! I would have to say I've always been a bouncy person, but since retirement I bounce even more! Especially when sewing, quilting, or blogging about them! Thanks for the yummy chance! Bounce is such a "happy" quilt to view. I really like all of the options available with this pattern. Of course, I have every one of Carrie's patterns and love her directions. I'm sure Bounce has wonderful directions as well. I think I'd like to make it out of the Farmer's Market fabric by Moda. Thanks for sharing this wonderful quilt! I love the colours in the quilt and so summery. Anything puts a bounce in my step, from the smallest thing seeing a bee busy at work in the flowers to our Boys coming in and just giving me a hug for no reason. I love Carrie's patterns and have all her books. Now what I need is more time, have you any going spare?!!!!!! The wait is over... and I am as excited as I thought I would be to see this beautiful quilt! The pattern is just amazing/both versions. The design is awesome... I love your "bounce". The quilting is perfection. I need/want/must have that pattern! Adorable. I am bouncing for joy! I need a new project. I am a star junky and this quilt is perfect! I love that you have so many options, layer cake, fat eigth bundle etc. Love the way you made it scrappy within colors. Thanks so much for sharing! Great giveaway! Thank you for the giveaway chance. Finding time to piece a quilt puts the bounce in my step. Your blog is fun to read. I am not a morning person, so I don't bounce in the morning - maybe late, very late at night. But it's still another great Rosie and Carrie pattern. What an honor to be asked to make the quilt for Carrie's pattern cover! 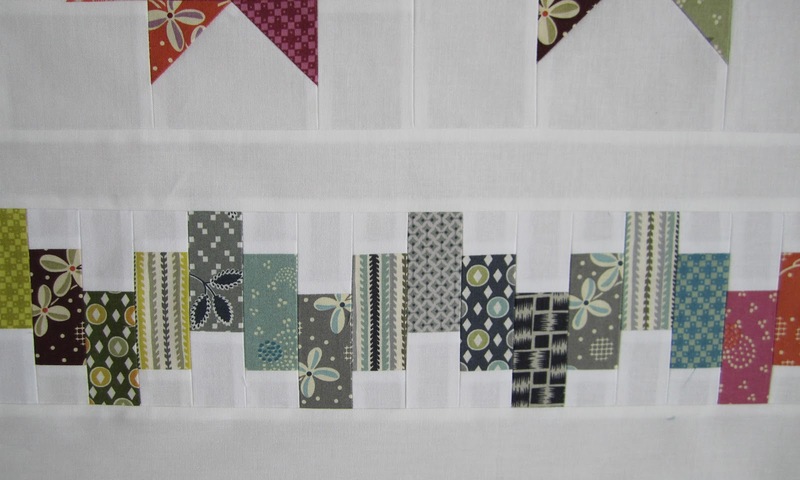 It's not just your careful piecing; it's also the way you put fabrics together. I really love the way you kept the scrappiness color-themed. What a beautiful quilt! What makes me bounce? Fondling fabric! Being grateful each and every day keeps a bounce in my step...well that and also my grandkiddos....and my stash of fabric,which I could just stare at everyday!! Getting up early early to work outside. In Texas you HAVE to get up early to go outside!! I love working in the dirt...pulling weeds is a favorite. I know..most people think that's crazy but I love it. Also love Bounce...a could see a smaller version as a baby quilt. This would make a good baby quilt. Going to see my kids and granddaughter puts a bounce in my step. Love Miss Rosie's Quilt Company, Love Hope Valley and love your Bounce! Thanks for the chance, it turned out great! Congratulations to YOU!! You did a great job on this quilt. I saw Linda's quilting. Amazing in her own right. My kids are learning to love sewing! That puts a lot of bounce in my step. Of course, it will put bounce in the step of the quilt shop owners too now that three of us will be purchasing fabric! Love this pattern and I can never have too many stars. A happy family and a whole day to quilt puts a bounce in my step!!! Thanks for a chance to win. Thank you. No really, thank YOU! Working with you was great fun and that will always keep this a very "happy quilt" for me. What puts a bounce in my step is waking up to birdsong after a night of sweet dreams. I do like this pattern and its possibilities! That has to be so cool- sewing for some one whose patterns you love. At the same time you're a GREAT quilter so Carrie is getting a great deal as well. Love the pattern and your version. Actually sleeping at night and through the entire night puts a bounce in my step. Thanks for sharing the the chance to win the pattern. Bounce is a great quilt, Thelma, and I would love to win the pattern. Playing with my 11 months old granddaughter puts a great big bounce in my step! Thanks for the chance to win. Joan S.
This is another great pattern by Carrie. I do enjoy making her patterns. I get a bounce in my step when I am able to squeeze some quilting time in my day. Thanks for the chance to win your giveaway. Congratulations on having a cover quilt! That's got to be so exciting. And Carrie seems like such a nice person. I have a bounce in my step when I get out of bed too. I take my dog to the park first thing every morning and we try to walk 5 miles or so. It's a great way to start off the day - fresh air, the smell of honeysuckle and some wonderful exercise. Although with the temperatures climbing towards 100 we are starting to wilt a little by the end our walks! What a fabulous design! Thanks so much for a chance at the give-away! My kids (12 & 23) give me lots to bounce about! Yup, they have me coming & going intellectually & physically that I certainly feel like a ball tossed around! Getting up in the morning to a beautiful, sunny day puts a bounce in my step. I just wish we would get a few more of those mornings! Feels like fall here in the Pacific NorthWet. Gorgeous quilt, Thelma. You did a lovely job. What puts a bounce in my step? Life with my DH, and getting time to quilt. Looking forward to seeing your next project. I love it. Hope Valley is such a gorgeous line and I'm so excited for this contemporary design coming from Carrie - can't wait for it to hit her store. Sunshine and blue sky make me bounce; even when it's really cold in winter, the energy of the sun gets me going! This is a lovely quilt. I really like the contrast with the white background! Thanks for the chance to win a copy of the pattern and fabric. WOW! That's why I love Schnibbles so much - an opportunity to make a quilt with a fabric or colorway that is so out of the box. Thelma, your work is always outstanding; and I'm glad you are a blogger so I can be inspired by you. Great job. My grandchildren make my heart bounce.. so do stars so this pattern is right up my alley. I love your fabric choice! Life is full of amazing wonders and discovering them energizes me: beautiful days, grandchildren, a wonderful job (longarm quilting). So a grateful attitude is what puts a bounce to life! I love your amazing work! You even motivated me to learn hand appliqué with your Evening Bloom project - and I really enjoy it now! Beautiful quilt! I do believe the color choice makes it even "bouncier"! The quilting is fabulous! Lucky you - getting to piece a quilt for Carrie! Right now - fresh raspberries off the bushes puts a bounce in my step! Thanks for the chance to win the pattern and fabric! I've got a layer cake waiting to bounce off my sewing table!! Two great gals make a great team - I adore Carrie and her wit, and I've become quite addicted to this site - lots of eye candy!! I'm really glad you gave us a step by step through sewing the Bounce pattern. When I first saw the quilt, I wasn't too interested, but got more interested as I understood what decisions you got to make and saw the close-up photos. This really looks like a fun pattern to sew! There are many things that keep me bouncy, but one of the best is my workout. I do all the necessary parts - strength w/ core, arms, legs, whatever, but the most fun is the eliptical machine. Does it for me every time! What a wonderful pattern. You can't go wrong with Carrie's patterns. I would have to say outings with friends puts a bounce in my step. I LOVE your version of Bounce. Another great pattern from Miss Rosie too :) Can't wait to get it....thinking I might try a Sweetwater line. Also, it was SOOOO nice of you to give credit to your machine quilter. As a machine quilter myself, I know how nice it is to be recognized for our art! P.S. Being with my three cherubs gives me my bounce! Love the pattern and the border...how cute is that! Just walking into my sewing room puts bounce in my step and this weekend, I got to meet Lisa Bongean from Primitive Gatherings! I was in Raleigh to visit my brothers' family and went to the Expo to shop and take her wool applique class. Loved it! 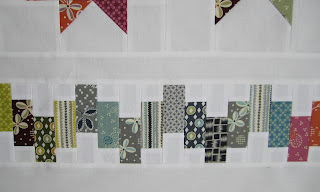 I bounced over here from Linda's blog--what a lovely quilt, and yes, I need a layout page! Amazing the things we learn from those who work hard to bring us great patterns. Your version is lovely, and now I'm going to bounce over and see Carrie's version. This is such a great pattern, and I love your version--I agree, Hope Valley looks great when it's cut up and sewn into a quilt--really great! What a great pattern! Can't wait to go check out the quilting too. Going to a quilt shop and looking at and touching fabric...that puts a bounce in my step! Thanks for the opportunity! I am also someone who wakes up happy and with a bounce in my step. But later in the day I'm sometimes dragging. The last few weeks what has picked me up has been calls from my son who recently moved over 800 miles away to start his first professional job. It's hard being apart, but it does give me a boost to hear about his new adventures. Love this quilt. Your version is lovely. I have made many Schnibbles for seasonal wall hangings and receive lots of compliments on them. What makes me bounce? Planning my next quilt! When I first saw this quilt on Carrie's blog it was immediately my favorite of all her new ones, the title just fits. It does have bounce and I like the way you did your scrappy stars and the borders, keeping them scrappy, but colorway together. To me this quilt is just fun and happy. This is definitely on my list of want to do's. Thanks for sharing. So fun! I love your colors..thank you! Oh thank you for a chance to win. What puts a bounce in my step? Living with my best friend, my DH :0), he is funny, cute and very thoughtful....a perfect best friend. Congrats on your quilt for Miss Rosie it's a real gem. Spending time with wonderful friends is what makes me bounce! Pondering ideas for new quilts puts a bounce in my step...along with the joy of seeing my childrens hard work to acheive pay off...watching my cute little Grandson explore the world with all the wonder a 2 year old can muster and cuddling my rescue puppy of 2 years and seeing the love and devotion in her beautiful brown eyes every day. And of course, it goes without saying, having an incredible friend to do the shop hop road trips with and to sew with on the weekends...a friend who truly "gets" me and shares the same love of quilting and fabric fondling...often the same bolt! I am blessed...but would be blessed and bouncing if the Bounce pattern turned out to be mine! Your quilt is absolutely gorgeous! I can't wait to make this! I love the quilt !! A package full of quilt goodies on the doormat, a finished quilt ;; bounce my step. Someone will be very lucky. Love Carrie's new pattern. What makes me bounce? - a tall glass of sweet tea on a hot day, a lap full of cat on a cold evening (my cat Grady still wants a lap even though it's now in the 90s & soon the 100s), a new quilt pattern to try. Thanks for the chance to win. I love your quilt! I have been wanting to make a red/white/blue quilt for some time, and I think this is it! I get a "bounce" when a bud I've been waiting to bloom, blooms. Another "bounce" comes when the hummingbirds are at their feeder or in the bloom that just opened. But I also get a "bounce" when I look at all the quilting that you do!! Love your blog, Thelma. Thanks for a chance to win a pattern and fabric. I just love this pattern!! And I love your version and Linda's amazing quilting!! Just wonderful!!! Coffee-- lots and lots and lots of coffee-- puts the bounce in my step and if I'm working at Starbucks, it's a quad espresso lol! I've been so eager for this pattern since Carrie showed a sneak peek of it on her blog! Hmmm... what puts a bounce in my step... looking forward to Friday night, when I don't have to cook dinner and we get to veg out and watch scary movies! Wow! I just love this quilt. Beautiful!! I get a bounce when my grandchildren visit or when I have fresh flowers in the house. Your quilt would put a bounce in anyone's step and Linda's quilting is just amazin I have to make the quilt, just love it!